"What do you do when you wake up and realise that your life has been an empty pursuit of the superficial and the trend-driven? That your identity and value systems are based upon a brand hierarchy of your own creation? 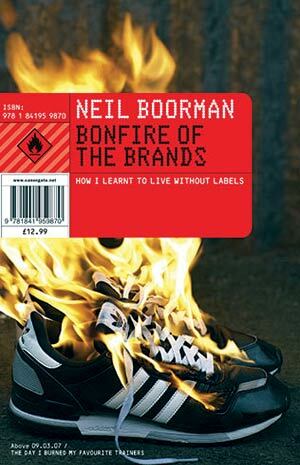 On 17th September 2006, in Finsbury Square, East London, Neil Boorman burnt all his branded items. The ones that wouldn't burn, he destroyed with a sledgehammer. The event was the culmination of a long process of self-examination, and of the brand-dominated world in which we live, recorded in a popular and controversial blog online. As a product of a generation that has been sold to since birth Neil examines the social, historical, economic and psychological ways in which brands have gripped our society, as well as documenting his personal trials and tribulations as he tries to live a life without brands. How will he cope without a hit of his Crackberry? Will he feel naked without his Nike, Gucci, and, of course, Marlboro?" A burgeoning trend in the book market, readers are seeing ever more of the "let's-do-something-crazy-and-then-write-a-book-about-it" genre. Ranging from trading a paperclip all the way up to a house, to trying to live without money for a year, one might be forgiven for thinking that the market has by now been saturated by these increasingly crazy ideas. This format certainly continues to work well on television too, particularly through the inimitable Justin Lee Collins, and this effort by Neil Boorman shows no sign of the genre's momentum slowing. There are several reasons for the popularity of the format: they usually take place within a set time period, allowing readers' (and viewers', if we also consider TV) attention to be kept by the attraction of a quick resolution; the out-of-the-ordinary focus also fulfils its purpose, which is to draw people in and keep them there; and, furthermore, the zaniness makes a nice change from misery lit and vampire stories. The central protagonist is perhaps by default engaging (or even an annoying character will inflame readers' and viewers' opinions and still keep them interested) and may often attract media attention, which can further boost sales and viewing figures by capturing the attention of people who may not otherwise bother with such stories. Plus, as human beings, we all like a challenge and want to see the main character succeed (or at least show cojones in trying). But, nevertheless, Boorman is still one of a few key players in this genre (alongside Kyle Macdonald, Danny Wallace, Dave Gorman, and others), and there are several reasons for this. Perhaps crucially, the challenge chronicled in Bonfire of the Brands not only received an encouraging amount of publicity (in established broadsheets as well as on television, online, and on the radio), but is also highly interdisciplinary in itself, both aspects of which combine to attract the widest possible audience. It is psychological and personal as well as being crusading and humorous; it also refers to modern history and grabs modern people in the crotch, perhaps unveiling aspects of human nature and our dependency on consumerism that arguably not everybody wants to hear or think about. Opposition to Boorman's principal idea is also described at length in Bonfire of the Brands, and admittedly it is difficult to grasp the sheer waste of burning and destroying stuff that still worked perfectly well and could have been put to constructive use elsewhere. But Boorman has thought his response through: as well as being pretty dramatic, he also points out that by (say) giving away his possessions to charity instead, this merely allows obsessions with brands to continue circulating and permeating, rather than making the more suitable statement of destroying them completely and showing that human dependency on brands should be lessened. Boorman's book, therefore, rather than just being funny or crazy like others in the genre, demarcates itself as being different by challenging not only the author (we are shown everything from Boorman's subsequent depression at having given away everything, including television and video games, to the hate mail he receives online, to his nicotine withdrawal) but also the readers. This not only represents an intellectual challenge (there's some fairly deep psychological and socio-historical and cultural analysis in there that mean you have to focus more than you might expect for a book of this genre) but also a challenge to the status quo: Boorman shows that you don't just have to accept what's around you, and that if you are determined enough, you can reject it if you want to. The end of the book is consistent with moving ahead into a new phase of life, but in a far less schmaltzy and more fitting way than the end of Kyle Macdonald's One Red Paperclip; the overall result is that in its provision of a simultaneous social and personal history, this book stands out from the crowd both in its genre and generally (although the brightly burning picture of Nike trainers on the front cover is probably helpful too).